Michael Robertson: ACTUAL Stats for radio business and they're very revealing! Recently with my startup DAR.fm I've got into the radio business after more than a decade in the digital music business. One aspect I find surprising is few people in the radio business have statistics about the business. Ask how many listeners a show or station had and nobody knows or if they know, they ain't telling. Sometimes they toss around Arbitron numbers but those seem designed to obfuscate more than enlighten. I decided to change this with DAR.fm and we're now publishing statistics for every single show. The stats aren't hidden or displayed as a percentage of some unknown base, but actual numbers. On the upper left hand corner of every show page is data for the last 30 days both totals and trending numbers. DAR.fm uses this data rank for every show by actual user activity. 1) Half of the top political shows are from progressive/liberal hosts. When most people hear "talk radio" they think Rush Limbaugh or Glenn Beck and sure enough they are #1 and #2. However, #3 is liberal Rachel Maddow and she's not alone in the top 10. 4 of the top 8 political shows are from the left side of the political spectrum. Click here to see others in the top 10. Much like the last election revealed, the country is split ideologically and although AM radio has many more conservative stations there seems to be interest in the other sides views as well. 2) Single station standouts point to promising new talent. Many of the top 40 shows are carried on many stations giving them ample offline exposure to drive online interest. But nestled among those more recognizable names are some show hosts who garner significant online interest with only a single station promoting them. 3) Podcast listenership is dwarfed by radio talent. The top 40 only has a few podcast only shows. While podcasts make get online exposure their listenership is tiny compared to the audio talent which uses radio and TV to push their shows. Data provides new insights into radio trends for both hosts and listeners. 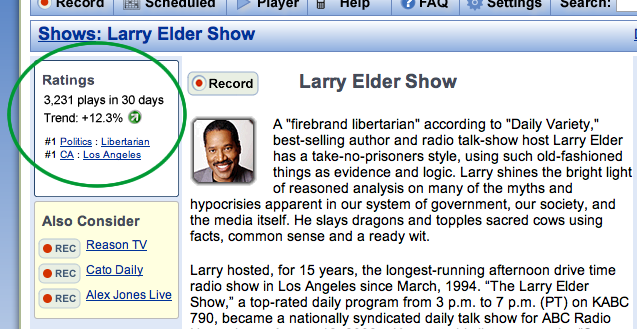 Browse show stats on DAR.fm and let me know what observations you have.